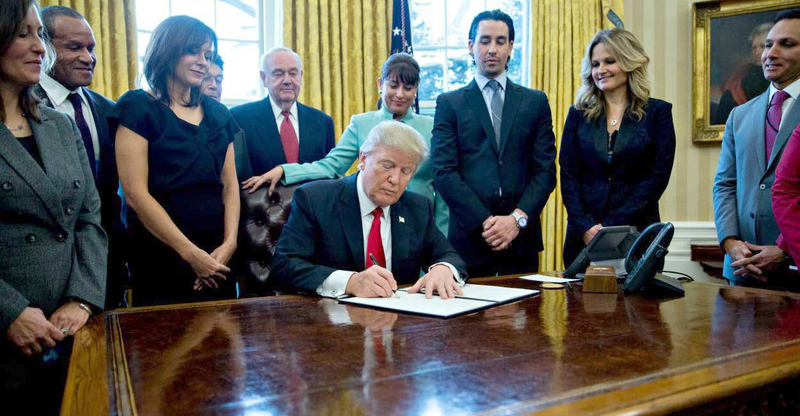 M. Luis COO, Natalia Luis, invited to a discussion at the White House on the struggles of growing a small business through existing regulations. Washington, DC – Natalia Luis, COO and Co-Chairman of M. Luis Construction Co., Inc. and M. Luis Products, LLC., and nine other small business owners from across the nation, met with President Donald Trump in the Roosevelt Room of the White House for a roundtable discussion on plans to cut regulations on small businesses. Each small business was given the opportunity to speak on the current successful growth of their business and the challenges of growing their small businesses in, what some consider to be, an environment of excessive regulation. In her public statement, Natalia Luis said, “I am grateful today for the opportunity to have a candid conversation on some of the over regulation that impedes our ability to be efficient and effective as we can be. I think this is a huge step forward and we are looking forward for more to come”. The meeting was followed by President Trump signing an executive order requiring agencies to cut two existing regulations for every new rule introduced. The order also establishes an annual cap on the cost of new regulations. For the duration of fiscal 2017, the cap will require that the costs of additional regulations be offset by undoing existing rules. “When there is federally funding involved in State executed or municipally executed contracts, there are three layers of government. It can get daunting when you are running a $100K contract or $10M contract, and essentially the administration of that contract is the same. I think we can do better than that, I think we can be more efficient, I think we can be more productive in that regard.”, she stated during her appearance on Fox and Friends January 31, 2017. For press inquiries, please contact Natalia Luis at natalia@mluisconstruction.com or 410-545-0641.